Background: Odontomas are mixed odontogenic tumors composed of mineralized tissue of ectomesenchymal origin. According to the World Health Organization (WHO) ranks, the odontomas are classified into two main types: complex and compound. They are usually detected in routine radiographs and may be related to various causes, and are rarely associated with impacted teeth. Purpose: The aim is to present two clinical cases of complex odontoma that prevent appropriate eruption of permanent teeth. Material and methods: We present two cases of complex odontoma associated with a retained permanent tooth. The orthopantomography and CBCT revealed circular and ovoid in shape amorphous radiopaque masses, surrounded by a thin radiolucent zone in association with an impacted permanent tooth. Results: The treatment of choice was extraction of the primary first molar, enucleation of the odontoma and the preservation of the first premolar. 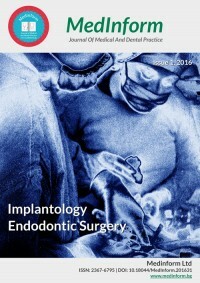 The complete removal of the complex odontoma was successfully performed, since after few months of follow-up the maxillary permanent teeth resumed their eruptive process. The result of the biopsy confirmed cases of complex odontoma. Conclusion: Odontomas are tumours of the dental tissues and may interfere with the eruption of the associated tooth. The early diagnosis, followed by a proper treatment at the right time, will result in a favorable prognosis and a desirable development of occlusion.